How do Great Spotted Kiwis interact with others? Humans are blamed for the downfall of Great Spotted Kiwis, along with all the other species of kiwis. We have invaded their habitat and ruined it. We cut down forests and put up buildings and other things that we find "more important" than saving the habitat of many species. Because we are the cause of their downfall, we are also responsible for their recovery. There are currently movements in New Zealand to help preserve the habitats of the Great Spotted Kiwi. There are also sanctuaries that Great Spotted Kiwis have been introduced into. The efforts of the Kiwi Recovery Programme, a tri-partite initiative between the Department of Conservation, the Bank of New Zealand, and the Forest and Bird Protection Society have raised public awareness about the threat of extinction to the Great Spotted Kiwi, as well as all other species of kiwi. They have thousands of volunteers working to save the Kiwi. Kiwi are very strong and often very bad tempered. 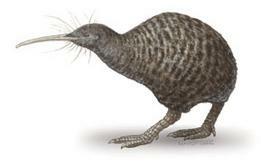 Also, the Great Spotted Kiwi are the largest of the species of kiwi. Adult kiwi use their razor sharp claws for defense. They are extremely territorial, and protect their "patch", which can be rather large, by calling, chasing the intruder out, kicking it, or using their claws. When aggrevated, they make noises that can range from a growl to a hiss, along with a loud bill-snapping, which is bound to scare at least the smaller animals away. Great Spotted Kiwis are pretty protected from airbourne predators because of their coloration (dark brown to gray) and their hidden lifestyles. They out lived their main enemy, the giant eagle, which is now extinct. The giant eagle is a distant ancestor of the bald eagle, which is now the nationl symbol for the USA. Because it cannot fly, however, kiwis have no real defense, besides kicking and clawing, from threats on the ground. Their main predators are stoats, ferrets, weasels, possums, pigs, dogs, cats, and humans. How do they interact with eachother? In a very densely populated forest in New Zealand, maybe 4-5 Great Spotted Kiwis will be found in a square kilometer. They are very territorial. Once finding a mate for life, they protect their burrow and area around it fiercely. If another kiwi enters their area, they will attack, using their legs and beak. "Ownership" of an area does not generally change until the male dies. What else is in the area? Chlamydomonas reinhardtii can live in the mountain tops, where Great Spotted Kiwis can also live. Cyathus striatus, or Bird's Nest Fungi, can inhabit the burrows of the Great Spotted Kiwi.